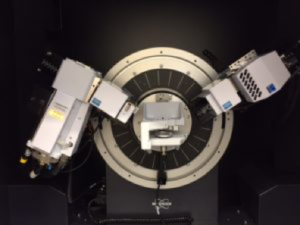 A Bruker D8 Discover GADDS and Bruker D8 Advance Powder Diffractometer have been added to the CCMR X-ray diffraction facility in their new Bard Hall SB56 facility to better serve researchers. Both systems come with access to a Powder Diffraction File (PDF) database with ~250,000 patterns for pattern recognition and analysis. For more information on these two systems please contact Maura Weathers (msw11@cornell.edu) or Phil Carubia (pmc228@cornell.edu). More information about the individual systems below. Bruker D8 Discover General Area Detector Diffraction System (GADDS): This system features a Vantec 500 2D detector, a polycap focusing system with Cu or Co sources that produce an intense, focused, monochro matic X-ray beam. The beam can be collimated to a spot size of 0.3 mm, enabling microdiffraction from very small sample volumes. The system’s 4-axis stage (X, Y, Z, and phi) permit automated surface mapping. 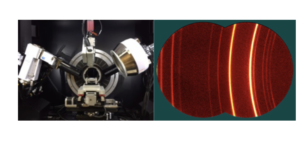 The 2D detector provides texture information that will indicate degree of poly-crystallinity and 2D data can be integrated to provide a 1D diffraction pattern for comparison with the PDF database. The GADDS goniometer and representative arcs from a Cu/Zn compound is shown. D8 Advance ECO powder diffractometer: This theta-theta diffractometer with high speed silicon strip detector has 160 channels which provide data collection rates approximately 100 times faster than a standard scintillation counter and can suppress sample fluorescence in iron bearing samples. The detector can also be used in point mode to improve signal to noise on very weak diffraction peaks. The system can be used to analyze powders, bulk samples, polymers, and polycrystalline films.